Chicken Noodle Soup + Orange Juice = Sickness Cure? There’s nothing like a steaming hot bowl of homemade chicken noodle soup to pick you up when you’re not feeling the best. Every time I’m sick, my mom loads me up on orange juice and chicken noodle soup. I don’t mind either so I scarf both down, not actually sure if it helps or just consciously makes me feel better. As I sit in au bon pain and scarf down a bowl of soup, I can’t help but wonder – is chicken noodle soup (and orange juice) actually good for the soul? UPMC Health Beat helps me understand this concept by first breaking down the ingredients and their purpose in an article published in 2014. The warm broth can help with the upper respiratory system and clear congestion. Chicken can help support the immune system, while the noodles will help you feel more full. While I always thought carrots, celery and onion were just for taste – they can help build a stronger immune system and fight off illness quicker. Of course medicine can help you fight off your sickness as well, but the antioxidants from chicken noodle soup can really help build a strong immune system and give the body the extra kick to conquer the illness. 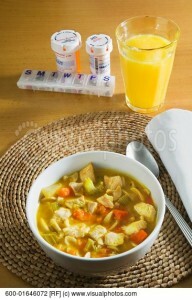 Studies have shown that a bowl of chicken noodle soup can work as an anti-inflammatory and help with congestion. A study conducted by Fox News explained that the key ingredient in chicken noodle soup to cure a cold is the chicken stock. The base can help decrease mucus production, even with store bought soup. When the study tried vegetarian soup, the results weren’t as effective as the soup with chicken stock as the base. The key is chicken! Not only does chicken noodle soup taste great, but it makes you feel better too. It’s a win-win. A big glass of orange juice has always accompanied a bowl of chicken noodle soup when I catch a cold, which is then followed by a few vitamin C tablets after my meal. OJ is key when recovering from being sick, but why? Fox News refers to a study done by the University of Toronto in the 70’s that the length of a cold can be shortened by one day just by taking the daily recommended dose of vitamin C. According to the FDA, 90 milligrams daily is enough. A glass of oj typically contains 120 milligrams of vitamin C – a good amount to help fight a cold. While some claim the daily dosage is helpful, Linus Pauling – a biochemist – insists that taking four times of the daily dose can help tremendously. Others say that exceeding the dosage has no actual benefit and the recommended 90 mg is just as helpful. Bottom line – no matter how much vitamin C you intake, benefits will follow – whether its in the form of a tablet or a cold glass of orange juice. Chicken noodle soup and orange juice is my favorite cold remedy combination that has ongoing positive effects and can kick a cold away in no time. This entry was posted in Uncategorized on October 20, 2016 by Elsa Breakey.